Recreational or cultural interest areas are attractions that are open to the general public for the purpose of play, pleasure, or relaxation. Recreational attractions include such facilities as campgrounds, parks, ski areas, and gaming facilities, while examples of cultural attractions include museums, historical buildings or sites, and art galleries. Recreation and cultural interest area signs are to guide road users to a general area and then to specific facilities or activities within the area. Recreational and cultural interest area signs may be used off the road network, as appropriate- such as identifying trails, structures, facilities, etc. 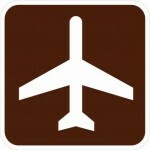 Recreational and cultural interest area symbol signs are available in three material grades (engineer grade, high intensity, and x diamond grade) as well as four sizes (12'' x 12'', 18'' x 18'', 24'' x 24'', and 30'' x 30''). 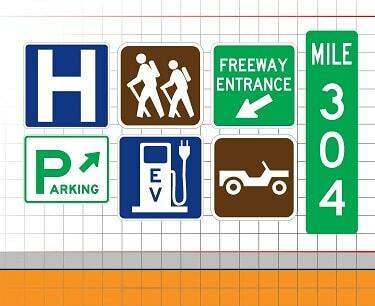 Our recreation or cultural signs are MUTCD / DOT compliant and made with the highest quality .080 aluminum, coated with the industries best 3M or Avery reflective sheeting and printed to last beyond the sheeting warranty. Best quality every time.